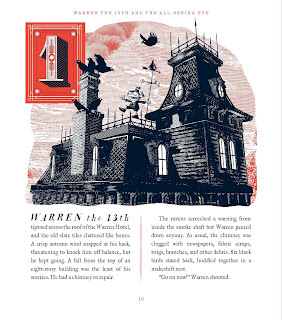 The Warren Hotel, designed by Warren the 1st and built by Warren the 2nd, has been passed down through the generations and Warren the 13th is set to take over on his 18th birthday. Currently twelve years old Warren is living and working in the somewhat rundown hotel alongside his evil Aunt Annaconda and lazy Uncle Rupert. Despite his love of the hotel, working under the strict rule of his Aunt means that Warren dreams of a big adventure and he certainly gets one in this quirky middle-grade fantasy tale! When Warren’s Aunt learns that a powerful object called the All-Seeing Eye is hidden somewhere on the property she is determined to find it. Question is, can Warren stop her in time to save his family’s beloved hotel? As word spreads about the power of this mysterious object, guests start to flock to the (usually rather empty) hotel, keen to find it and claim it’s power for themselves. With new friend Petula in tow, Warren sets out on his own mission to locate the Eye, crossing paths with a whole host of weird and wonderful characters along the way, including my personal favourite, Sketchy! Not only is this charming adventure tale packed full of fun but it is also beautifully illustrated. The imagery plays a big part in the story and the illustrations, which have been created using a simple black and red colour scheme, compliment the text perfectly and were my personal favourite part of the book. The layout is also stunning and it’s easy to see a lot of thought has been put into this element, which I really appreciated. 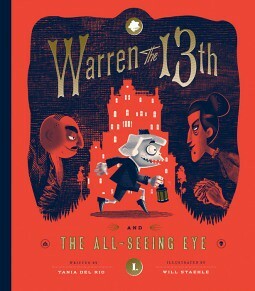 As I don't generally read a lot of middle-grade titles I can't comment on how Warren the 13th stacks up against what else is out there, however I can tell you that I really enjoyed following Warren and co. on their adventure. Plus, the amazing illustrations definitely make the book one to pick up!